Go-Go Elite Face Lift New for 2019 is the new look tiller design for the Go-Go Elite Traveller from Pride Mobility. 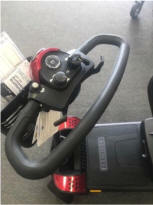 The new elongated D-Shaped handle bar give multiple hand positions as well as hand protection. With this new design you now operate the throttle using your figures rather than the original design where you had to use your thumbs. The top console has stayed the same with all the usual features like speed dial, horn button, battery gauge, key and charge port in the same location. What's in store for 2019 What's New for 2019?. Las Vegas Scooters & Lifts had a fantastic 2018 and we are looking forward to what 2019 has in store for us. 2018 saw the introduction of several new scooter products from Pride Mobility such as the Revo 2.0 Victory 9 and 10 2.0 and the Jazzy ZT which was a big hit for us last year. 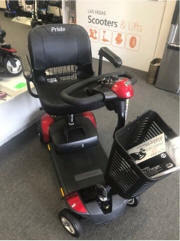 With our new store which gives us plenty of room for display's and expansion we are always looking for new products not just scooters and power wheelchairs but other innovative home help devices. We are again looking forward to the 2019 MedTrade expo here in Las Vegas to see what new products are out there and what improvements the manufactures are planning for future years. April 16-18, 2019, at the Mandalay Bay Convention Center in Las Vegas. 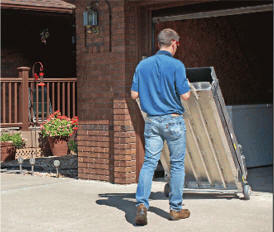 New for 2019 one of our Lift and ramp suppliers PVI have just introduced their first large easy move ramp. 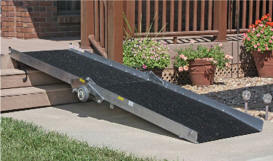 The all new Wheel-About-Ramp gives you the robust design high weight capacity and the great feature of not having to carry the ramp with its all new wheel-about feature. WAB1030 10' 30" 66 1/4" x 36 3/4" x 16" 84 lbs. 600 lbs. WAB1230 12' 30" 78 1/4" x 36 3/4" x 16" 98 lbs. 600 lbs. WABU1030 10' 30" 63 1/4" x 36 3/4" x 16" 83 lbs. 600 lbs. WABU1230 12' 30" 75 1/4" x 36 3/4" x 16" 97 lbs. 600 lbs.